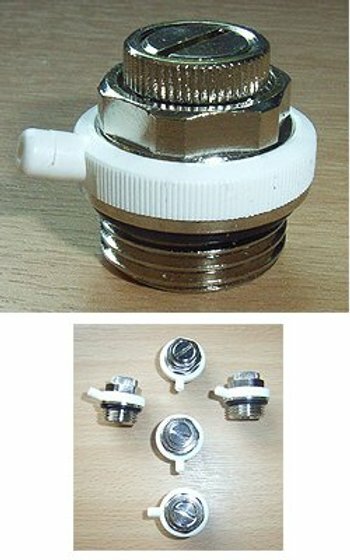 These automatic radiator bleed valves are smart valves which actively monitor the water levels and air and other gasses in your radiators and react automatically to increase efficiency and save you money. The trapped gas takes up space, creating pressure, stopping the water rising so that your radiator does not fill properly. Historically you would use a radiator bleed key, but the Germans have created a more efficient solution. You simply cut off water to your radiator, take off the valve as if you were going to bleed the radiator (with your towels and buckets at the ready for the last time), and screw in the replacement, tightening with a wrench. It is half an inch, so is a standard fit, and is self sealing and fitted with an o ring so you do not need tape. You want your radiator to be full, so that water heats and stays warm both at bottom and top of the radiator, and stops making gurgling radiator noises. When the smart valve senses water, it keeps the radiator sealed, when it senses lack of water, it knows there is air or gas in your radiator so releases letting out the gas so that your radiator can top up and reseals your system. Because the new parts work on the radiator, it does not matter how the units are fed, whether from a header tank or a combi boiler. They are also fine on sealed units and towel rails, radiators, heating coil, heating pipes, floor heating systems, boilers, tanks, wherever you can replace a supplied standard half inch valve. The worst affected radiators are usually at the top of your home as the gasses rise, so when fitting start there. We supply 5 so you can optimise several radiators, and can also help your parents or family keep warm and save money by fitting their radiators too. The smart valve technology has low tech back up, that clever valve seal which reacts has a spring loaded washer standing by in case of high pressure and you can also easily slide a collar with your thumb to manually bleed if need be. As you would expect from plumbing parts, the bleeders are made from brass which has been nickel plated, with the internal works encased in stainless steel. The automatic radiator bleed valves should last for many years. Automatic Radiator Bleed Valve text, images and video are copyright.